whiskerDocs | Anytime, anywhere, whiskerDocs is there! You have pets, we have answers! "My dog ate chocolate, I don't know what to do, but I know its toxic!" Pick up the phone and call as soon as you are worried, and we can help instantly! 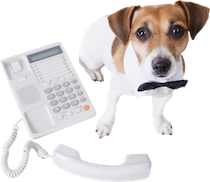 Our veterinary experts are standing by 24/7, live, to take your call. No matter how big or small the question, our experts are standing by! "My cat won't use her litter box anymore, I'm sick of cleaning up urine!" Need a detailed response? Just write us an email! You can even send pictures or videos. Our team will respond, sometimes with articles or additional resources, to help you figure out how to get things back to status quo. "I'm bringing a new puppy into the home, and we already have a cat, what can I do to train them to get along?" From your computer or mobile device, start a live chat for instant support on how to introduce Rover to Fluffy with relative ease! And when Fluffy decides she likes Rover's food, we will be around to help you figure that one out too! When I called and asked about Cookie being overweight, they told me to give her 30 minutes a day of exercise. It’s only been a month and she’s already a perfect weight. I was able to get some really helpful advice about what to bring with me to the appointment that will help me make the most of a very expensive neuro consult. The vet was super helpful and knowledgeable and gave me really good tips about what would help the doctor make his diagnosis. The help I received was invaluable. Sharon, Barbara and Dr. Dawn all helped me through the last days of my dear Dylan's life. The decisions I had to make were overwhelming, as I'd never experienced anything like this before and did not know what to do about so many things. To have them available to guide me was a blessing.